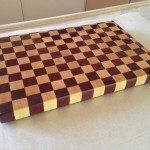 I made this end grain cutting board for my good friend Qais and his lovely bride for their wedding. Congratulations to them! It’s my first woodworking project and it’s not perfect, but I still think it came out pretty sweet. 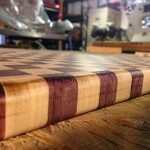 It’s made out of Hard Maple and Purple Heart woods that I got from Inventables. I mostly followed the tutorial from the Wood Wisperer. 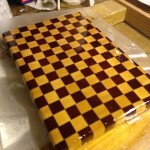 My pattern was different, though, mainly because I was limited by the 3/4 inch thickness of the boards I bought. I decided to do a small square pattern. 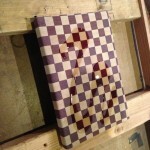 I finished it with mineral oil. 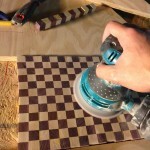 The processed required two stages of cutting and gluing in order to get the checker pattern and to expose the end grain. 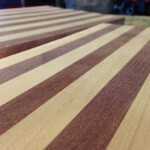 The end grain style is more durable and is easier on knives. 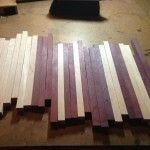 Boards cut and laid out. Glued all the slices except one. 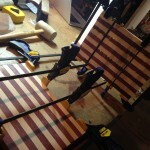 Boards squeezed together with grips and left to dry. Sanded a little bit at this stage. 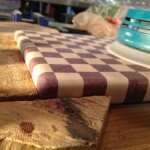 Slices flipped into a checker pattern. Glued again and squeezed together. Sanding, sanding and more sanding. 60, 80, 120, and 220 grits. 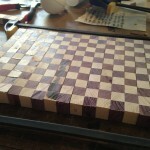 Routed to get straight and square edges. 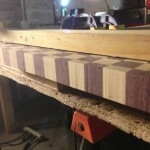 Routed to get rounded edges and corners. Let oil soak in. Applied multiple coats. 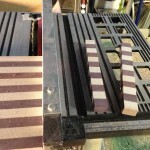 Table saws cut out a lot of material. 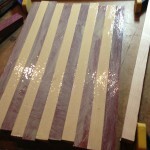 Each pass cost 1/8 inch and with such thin strips, that resulted in a smaller board than originally anticipated. Use a lot of glue. 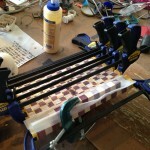 On the first glue up, I didn’t coat the slices fully. 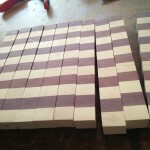 On the second slicing, some of those blocks fell apart and had to be painstakingly glued back together. Mineral Spirits are not equal to Mineral Oil. Luckily, I looked this up right before I ruined the board by dousing it in a non-food safe paint thinner. Use Mineral Oil from CVS or a drug store.